Home / News / Fireworks as RUTO finally responds to MURATHE’s wild allegations against him in his lecture at Chatham House in London-See what he said? Fireworks as RUTO finally responds to MURATHE’s wild allegations against him in his lecture at Chatham House in London-See what he said? Saturday February 9, 2019-Deputy President William Ruto partially addressed the wild allegations leveled against him by former Jubilee Vice Chairman, David Murathe during his lecture at Chatham House in London. Responding to a question from a reporter of Financial Times who wanted to pick his mind on the doubts cast on his suitability to succeed President Uhuru Kenyatta in 2022, Ruto, though trying to avoid the matter, said Kenya is a democracy and everyone is entitled to their own opinion. “I have not responded to Murathe in Kenya. I am not about to respond to him in Europe." “In any case, we live in a democratic country and everyone is entitled to their own opinion,” Ruto stated. The DP proceeded to indicate that Murathe was free to go anywhere with his allegations and even seek help in investigating him. 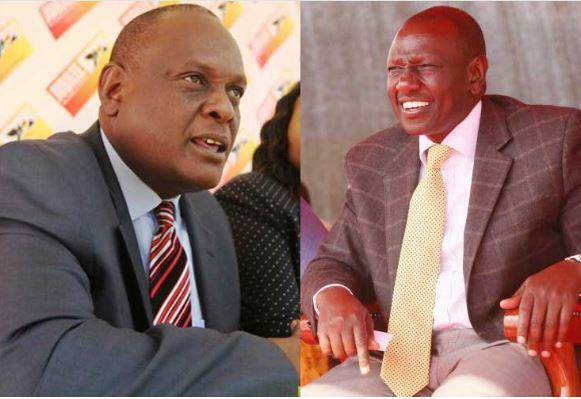 Murathe has accused Ruto of bungling the 2017 Jubilee party nominations in favour of his cronies besides being corrupt and has vowed to block him from succeeding Uhuru in 2022.